There is a Nicholas In “Middle Or New Parish,Greenock,Renfrew,Scotland” with the last name of Wecksell, Wickesell, Wikesell that marries Grace Macmillan on March 20th 1818 and has a son named Gilbert and a daughter named Helen. Gilbert was born on December 16th 1818 and Helen was born on December 10 1824. "Scotland Marriages, 1561-1910," database, FamilySearch (https://familysearch.org/ark:/61903/1:1:XYWH-Z8X : 8 December 2014), Nicolas Wecksell and Grace Macmillan, 20 Mar 1818; citing Middle Or New Parish,Greenock,Renfrew,Scotland, reference ; FHL microfilm 1,041,069, 102,058. "Scotland Births and Baptisms, 1564-1950," database, FamilySearch (https://familysearch.org/ark:/61903/1:1:XTNL-YDD : 8 December 2014), Nicolas_ Wickesell in entry for Gilbert Wickesell, 16 Dec 1818; citing , reference - 2:17F9XH1; FHL microfilm 1,041,059. "Scotland Births and Baptisms, 1564-1950," database, FamilySearch (https://familysearch.org/ark:/61903/1:1:XTNT-DM7 : 2 January 2015), Nicholas_ Wikesell in entry for Helen Wikesell, 10 Dec 1824; citing , reference 2:18J72SH; FHL microfilm 1,041,063. "Scotland Births and Baptisms, 1564-1950," database, FamilySearch (https://familysearch.org/ark:/61903/1:1:VQWP-67D : 2 January 2015), Nicolas_ Wickesell in entry for Gilbert Wickesell, 23 Dec 1818; citing MIDDLE OR NEW PARISH, GREENOCK, RENFREW, SCOTLAND, reference ; FHL microfilm 1,041,059. "Scotland Births and Baptisms, 1564-1950," database, FamilySearch (https://familysearch.org/ark:/61903/1:1:VQHT-875 : 2 January 2015), Nicholas_ Wikesell in entry for Helen Wikesell, 11 Jan 1825; citing WEST OR OLD PARISH, GREENOCK, RENFREW, SCOTLAND, reference ; FHL microfilm 1,041,063. 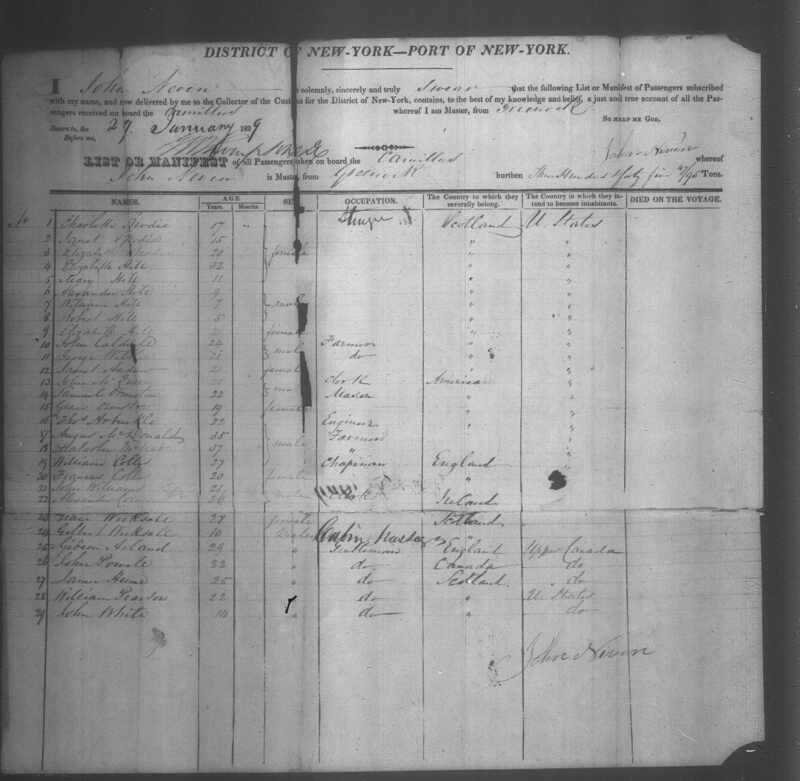 There is also a ship manifest that on lines 23 and 24 lists two Wicksalls arriving in the Port of New York on January 29th 1829. In one place Ancestry.com has the names transcribed as Gilbert Wicksall Age 10 and Nan Wicksall age 28. Looking at the original document I don’t believe Nan is correct. The name looks like ?race so this may be Gilbert’s mother Grace. There is a second Ancestry.com source that lists the name as Grace Wicksall. Gilbert’s age lines up with his birth in Scotland. There is no sign of Helen. In the January 5th and 6th, 1831 New York Evening Post there is a list of letters waiting for pickup at the New York post office. There is a “N Wicksall” on this list. In the Friday April 15th, 1831 New York Spectator there is a Grace Anderson Wicksall that dies at Age 30. Is this our Nicholas Wicksall? Nicholas was certainly old enough and this puts him fairly close to Connecticut shortly before 1835. Assuming Grace and Helen died, what happened to Gilbert?